or to order online from Do-It-Yourself Irrigation. Kasco Marine's NEW 8400VFX, 2 hp Floating, Aerating Fountain or Decorative Fountain Aerator is great for larger ponds. 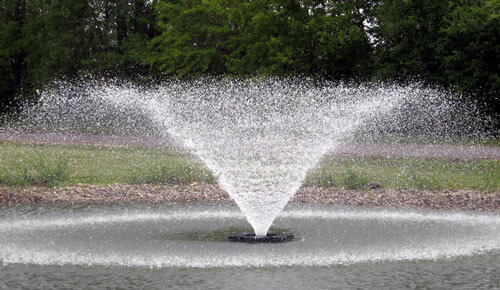 The classic Kasco "V" fountain pattern, 8' tall x 32' wide gives this model a beautiful fountain pattern. The larger motor and enhanced propeller design gives the 8400VFX 2.5 times the water flow as the 4400VFX. Kasco's 8400VFX Floating Aerating Fountain does an excellent job at adding oxygen and improving your pond or lake aeration. The floating, aerating fountain pattern will assist in improving your water quality as well as adding to the aesthetic appeal of your pond. The 8400VFX Floating, Aerating Fountains are available in 240V, 60Hz models. Adding a LR-375 Low Voltage Light Kit to the 8400VFX Floating Aerating Fountain adds a touch of class to this beautiful fountain display during the nighttime hours. The LR-375 Low Voltage Light Kit includes three machined, bronze, light fixtures with 75 Watt MR-16 Halogen bulbs in each fixture. The LR-375 Low Voltage Light Kit's transformer is built into light kit itself, so all you have to do is plug the lights into the C-85 Control panel. Three clear MR-16 bulbs are included with each LR-375 Low Voltage Light Kit, however, you can chose any or all of the optional colors of Red, Green, Blue, & Yellow. The 8400VFX Floating, Aerating Fountain also includes a GFCB protected control panel. The C-85, 240V Control Panel with Timer, GFCB protection, 120V GFI Protected Outlet for Lights, and Photo Eye for light operation comes standard with the 8400VFX Floating Aerating Fountain. Kasco recommends a licensed electrician to install the C-85 Control Panel and the 8400VFX if you plan to hard-wire the Floating, Aerating Fountain into the C-85 Control Panel. • Environmentally friendly oil-filled motor with a hard-face internal mechanical seal and external lip seal for protection against leaks. • Flood oil lubricated for excellent heat dissipation. • Superior dependability in salt-water or other corrosive environments. All external metal motor, float, and hardware components are of stainless steel composition and protected by a sacrificial zinc anode. • Requires minimal maintenance. We recommend cleaning the stainless steel motor housing once or twice per year and replacing the sacrificial zinc anode when visibly corroded. • Made with pride in the U.S.A.
• REDESIGNED FLOAT WITH LOW PROFILE AND ATTRACTIVE SHAPE! • Successful shallow water operation in as little as 20 "